Two locks with keys included to secure the materials in the case. Swing-open, polycarbonate plastic door designed for easy changes. Top concealed LED lighting maks it easy for viewers to read in the contents. Black aluminum frame that is durable and will stand up to any elements. 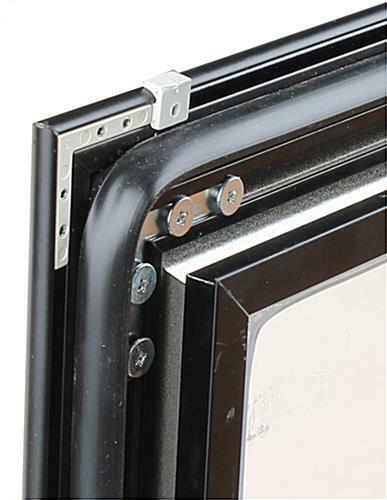 Rubber gasket sealed on the edge of the frame to keep moisture out when used outdoors. Power supply with 72" long cord produces a direct current of 12 volts, resulting in 30 watts of power for the LED lighting. 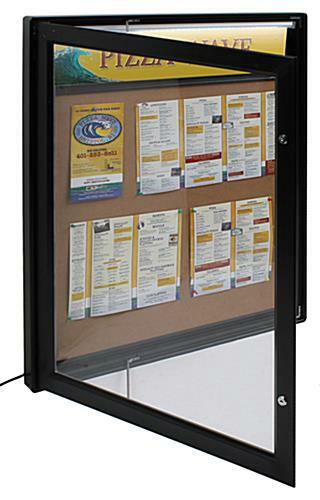 This outdoor menu cabinet is great for displaying important postings or upcoming events. 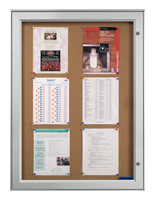 Each unit features a large interior corkboard surface that can be used to hold (8) sheets of 8-1/2" x 11" vertically or (9) sheets of 11" x 8-1/2" horizontally. 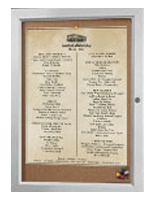 This exterior-rated wall-mount display can be used to display memos, posters, schedules, menus or new articles. 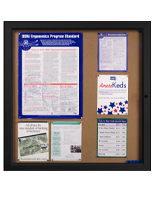 Unlike many other wall-mount bulletin displays, this swing frame features a concealed light at the top. This outdoor menu cabinet that illuminates is an effective way to capture the attention of passersby. The top lighting is also bright enough to allow viewers to read the content even in the nighttime. 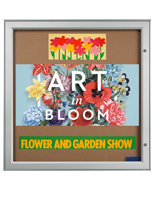 Businesses can keep the exterior-rated restaurant corkboard "ON" all day to draw more attention. This outdoor menu cabinet that is weather-proof can be used indoors or outdoors. 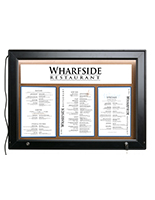 This exterior rated wall-mount display has an anodized aluminum frame with a black finish that will not rust either. 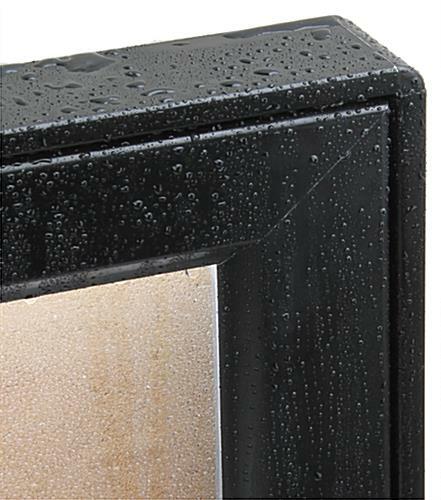 An illuminate swing frame, outdoor menu cabinet is engineered with sealed rubber gaskets around the frame to keep moisture and other elements out from the case. There are also two tumble locks attached to the door. 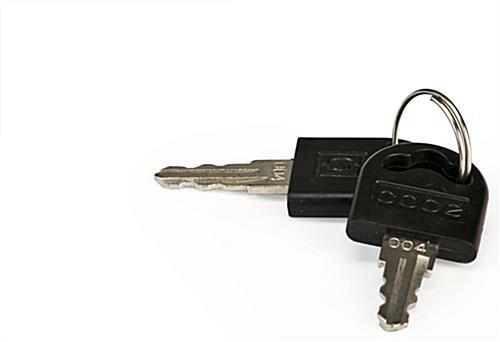 The lockable doors are mounted on full length hinges with two keys included. 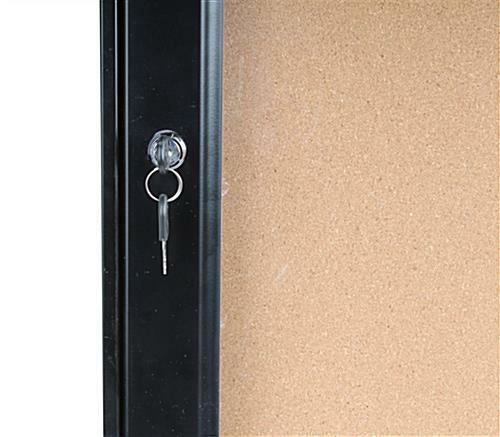 This enclosed outdoor menu cabinet that locks will secure all the materials in the case and prevent tampering. The illuminate swing-open frame allows users to easily change the graphics from the front without removing the unit from the wall. Each unit is made with both durability and convenience in mind. 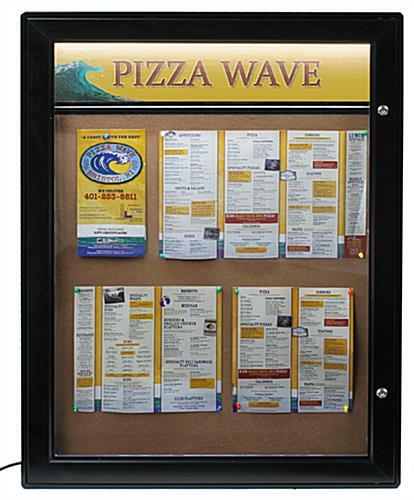 As an added feature the purchase of this outdoor menu cabinet, also known as exterior-rated restaurant swing frame, will include a bag of push pins and a removable divider. 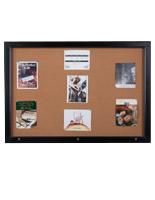 Users can use the detachable black border to create a header at the top or simply remove it to create large interior corkboard space. Although this aluminum illuminate swing frame is designed for outside use, this weather-resistant menu case is also great for indoor use. The purchase of this unit comes with a 72" long power cord with grounded plug. Most real world applications utilize a professional electrician hard-wiring the unit directly into the wall power source. 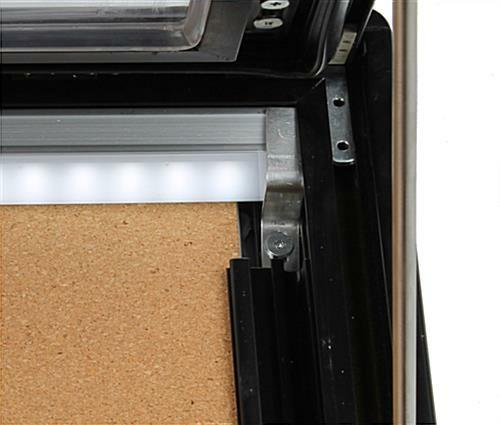 There are two Z-bars included with the unit which allow users to mount the enclosed corkboard vertically or horizontally depending on your needs. 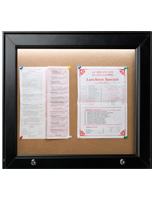 Screws, wall anchors and instruction sheets are also included with this exterior-rated restaurant corkboard for easy wall-mount installation. This enclosed illuminated swing frame is sold in other sizes as well. 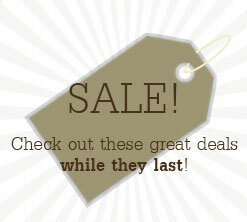 For more options, see the related products on the right. 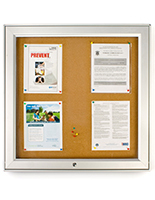 An enclosed corkboard can be used for many years with repeated tacking. 31.5" x 41.5" x 2.0"